Discussion in 'Vendor Showcase' started by Franchi Motorsports, Feb 23, 2012. I currently have two models in stock, the #3015 SF3 series and #9600 Livewire tuner. The #3015 units will run $290 and #9600 Livewire tuner be $400 ( Livewire unit also comes with window pedastal mount for free, $25 value ) Want to check to see if these will work on your truck? 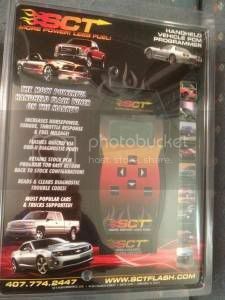 Click on www.sctflash.com, Search by Vehicle, enter your trucks info, and see if either a #3015 or #9600 populates. If it does, then it will work. Now bear in mind, since SCT doesn't have preloaded tunes for Rangers, these units are the method of HOW a custom tune is uploaded to your truck. How well your truck runs is dependant on who writes your custom email tune which you need to purchase seperate. I can recommend several performance shops that I've used personally and had great success with as well as several members of the board. Typical email tune will run about $70 dollars, it's a fairly easy process to do and I would be happy to work anybody though it or answer any questions about it. Broken out below is the steps that would need taken to custom tune your truck. 1) Decide on a tuner version, the SCT 3015 is the mainstream tuner that most folks use and the Livewire 9600 is the BIG daddy tuner which also can act as a monitoring station while truck is running. Below are links to both. 4) Upload custom tune to your truck via the OBII port. Only takes about 3 to 5 minutes to do. Also as a side note too, one thing I've found very useful on these tuners is that they can read and clear Check Engine Light codes as well, useful feature. I can accept Paypal as well as phone orders shortly with credit cards, just waiting for my new phone to be activated which should be in a day or so. Congratulations dude!! So you are all official there....Do you want to be an official vendor here now? I definately will be interested in getting one of these very soon. I am just waiting on my news gears and exhaust. Congrats! Just let me know Ranger. Anybody have any questions about these units feel free to post em up! Will you be doing custom tunes in the future possibly? I would definately like to! It's one of my goals but not sure of just when realistically that is going to happen. Got any questions, feel free to let me know! i got one. you know right before you load a tune and you can change the options what does the speed limit option do? so not let it go over a certain speed?